Aeroflot has decided not to create a new brand to replace its low-cost subsidiary Dobrolet, which was forced to close as a result of sanctions due to its flights to Crimea. While the sanctions are still in effect the new airline will operate under the nameless brand of Budzhetny Perevozchik (‘Budget Carrier’), and the planes may not have any labeling at all. Aeroflot, Russia's largest airline, has decided not to develop a new budget airline brand after all, contrary to earlier announcements. While its economy operator Dobrolet remains on the EU sanctions list, the replacement low-cost airline will be called Budzhetny Perevozchik (‘Budget Carrier’), reports the Russian business newspaper Vedomosti, citing a source within the airline. "Why develop a new brand when the well-known Dobrolet exists, and already has its value," said the source. When Dobrolet was placed on the EU sanctions list in July 2014 because of its flights to Crimea, European contractual partners, such as Lufthansa Technik, were no longer able to service it. Aeroflot then considered creating a new brand, but during one of the company’s board meetings a different decision was taken. Budzhetny Perevozchik will operate on a minimal scale: Its fleet will consist of four Boeing 737-800s, taken under a subleasing agreement from Aeroflot itself, and no new planes will be bought. It is possible that no brand name will appear on its fuselages, just ‘Budzhetny Perevozchik’ in small print. Experts believe that it is unlikely that the absence of a brand name will influence the low cost airline's marketing campaign. "For a budget carrier the brand name is not important since the main reason to buy tickets here is the low price," says Alexander Yeremenko, general director of Brand Lab. Yeremenko argues that image branding is unnecessary for Russian low-cost airlines, since there is no competition in the market and all the promotion is created by directly advertising the price of the tickets. "Before the 2008 crisis we had two budget airlines, Avianova and Sky Express [later both closed down - RBTH], but even back then they didn't compete with one another, since they flew to different cities," notes Yeremenko, who points out that Budzhetny Perevozchik will be able to use the brand Dobrolet onboard its planes. "I don't see any risks related to the additional promotion of the nameless brand," says Irina Zelenkova, advertising and PR director at FinExpertiza, who explains that Aeroflot can permit itself such a move because of the recognition and weight of its brand, especially in Russia. 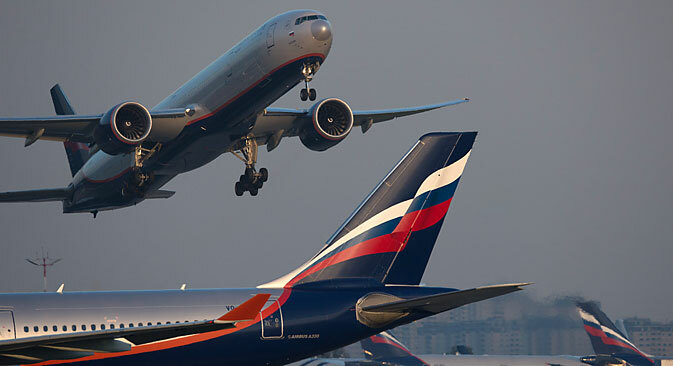 "Consequently, the Aeroflot low-cost project will be just as recognized and transparent in the eyes of a specific clientele ­- simply because it will be associated with a strong parent company," says Zelenkova. According to Zelenkova, since Aeroflot's Budzhetny Perevozchik actually has no competition in Russia, it can easily make do without a vivid brand, and instead base its reputation on its provenance alone, which should form a persuasive enough argument for customers. While Dobrolet is still affected by the sanctions, the airline cannot use this brand when working with foreign partners. For this reason the legal name of the new airline, Budzhetny Perevozchik, was registered in September 2014 with Aeroflot's full participation. Dobrolet's former general director received the same job with the new company. The new company has already applied for an operator certificate at Russia’s Federal Air Transport Agency Rosaviatsia. Once this is acquired, Budzhetny Perevozchik can receive a license and start selling tickets. "Aeroflot is convinced that the sanctions against Dobrolet are temporary and that there will be demand for the company's services due to its unique offer, even without the additional advertising," says Investcafe analyst Timur Nigmatullin. According to Nigmatullin, the absence of advertising costs may further stimulate consumer interest: "Thanks to the economic conditions, the company can maintain low ticket prices, which is the new airline's main competitive edge," he says. Dobrolet was planning to operate flights abroad, including to Spain and Israel - however, with the sanctions still in place, the company has postponed them for now. The question of a gradual lifting of the sanctions may be raised during the EU Summit on October 23-24, depending on the development of the situation in Ukraine, Russian news agency ITAR-TASS has reported, citing a diplomatic source within the mission of an unspecified Eastern European country.